What’s even more gross to think about is that dust mites feed off of dust. You can visibly see these itsy bitsy bugs with a microscope. Dust mites are what cause allergens and asthma symptoms: Runny noses, watery eyes, coughing, sniffles, and sneezes– oh my! No one should have to take a sick day due to poor office cleanliness. #1 Timing Dusting should be planned out on a schedule. How active is it in your office? For example; the amount of employees, customers, type of industry, kinds of rooms being used like cafeterias, etc. Based on how busy it is, dust might accumulate at a quicker rate. Remember our mathematical equation; more humans/animals= more dead skin/hair/clothing fibers/dirt/food crumbs, etc. This ultimately leads to more dust. For busier offices, consider hitting the high and low surfaces at least once a week. Less used spaces can be dusted bi-weekly or even monthly. #2 Tools Bendable and extendable tools are clutch in collecting dust. These two types of tools can reach spaces that are hard to approach. A step stool might also come in handy if trying to hit the high points in your office. Professional cleaners often times use HEPA vacuum cleaners (high efficiency particulate air). Other important tools to use for dusting are microfiber cloths, synthetic or feather dusters, Swiffer tools, damp cloths, and furniture polish. #3 Techniques Start high to low. Dust falls easily when your cleaning, so make sure to always dust the high surfaces to prevent having to re-clean low areas. Another tip to dusting is to begin by prepping. Consider using drop cloths on desks or furniture when dusting the ceilings and high wall spaces. Remove clutter from desk surfaces. Wipe away dust on desks, and then carefully clean each object upon returning it to it’s home. The most important thing to remember, as addressed above, is to consistently keep up with dusting. The longer you put it off, the more work you’ll have to do down the road due to buildups of dirt and dust. 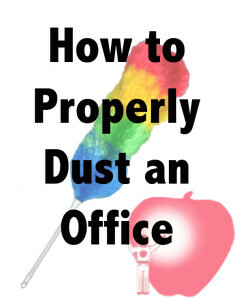 Allergies, germs, and sickness can spread more easily in a dusty office. Thus, we suggest to have a professional cleaning service care for your office’s dusting needs. Call Apple Corps commercial cleaning today for dusting and janitorial services for properties located in Massachusetts.